Most of you may have heard about Pakistan’s Millat ‘Facebook’, but I wonder how many of you may have heard about Renren, China’s “Facebook”! 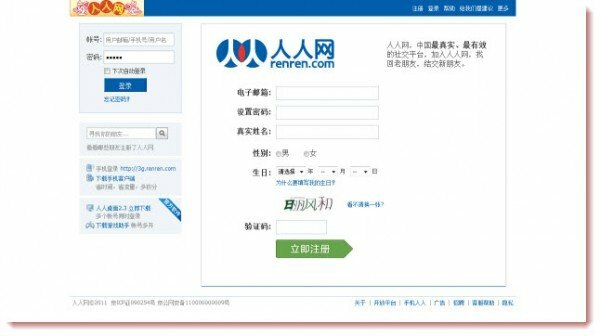 The Renren Network is a Chinese social networking site founded in 2005 has more than 150 million active users. It was earlier called as the Xiaonei Network, and is very popular among college students in China. RenRen’s user interface is very similar to Facebook and, its APIs are similar to Facebook’s with efforts underway to develop an SDK similar to Facebook as well. Wang Xing, who started the site, that is now called Renren, dropped out of a PhD program at the University of Delaware and returned to Beijing to create a local version of Friendster. It flopped. Two years later, he heard about Facebook! He said that his goal in creating a social network was “to make a better world.” Today, he almost never goes on Renren! Renren is on the rise and simply blazing ahead! Its lean, mean and fighting fit management team is more aggressive than the competition in China. It has also benefited from the fact that Chinese do not have access to some of the globally popular social networking websites. Most people in China use Facebook though. Anyone can copy the codes and modify it. China has a lot of smart people(but lazy to create their own codes) and with all the clones and illegal copy softwares, I wonder why you would say it is a “similar to Facebook’s”? Google also has a clone in China, since the name Google sounded like ‘Borhter’ in Chinese, so their version of Goole is called ‘Sister’. I guess you did not know that!